Washington will become the first state to embed a full-time artist in a statewide agency, bringing in a creative approach to advancing the agency’s goals like improving safety, reducing congestion, promoting economic vitality, supporting multimodal transportation systems, and creating healthier communities. 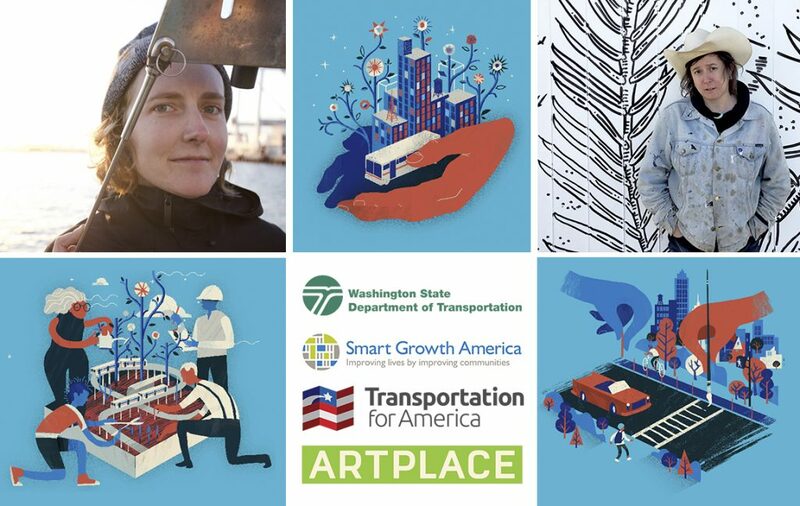 With the support of ArtPlace America, Transportation for America (a program of Smart Growth America), and the Washington State Department of Transportation (WSDOT) are creating a new one-year artist-in-residence program, the first of its kind in the country. Read the full news release about the artist team that was selected, and a brief Q&A with the artists selected for this groundbreaking program. We also opened applications for a similar program within the Minnesota DOT in March 2019. View the full Call for Artists with the sections below, or download the document as a pdf here. Click heading to expand each section or download full PDF here. Washington State Department of Transportation (WSDOT), in partnership with Transportation for America (T4America) and the State Smart Transportation Initiative (SSTI), seek an artist or a team of artists to serve as the inaugural WSDOT Artist-in-Residence (AIR). The WSDOT AIR will be tasked with advancing WSDOT’s transportation system policy goals: economic vitality, preservation, safety, mobility, environment, and stewardship. The WSDOT AIR will span one year, and the AIR is required to reside in Washington State for the duration of the year. The AIR will be based in WSDOT’s headquarters in Olympia, WA, but depending on the AIR’s project(s), the AIR may work from one of WSDOT’s regional offices in Spokane, Wenatchee, Shoreline, Tumwater, Union Gap, or Vancouver for part of the residency. The AIR will gain a thorough understanding of the inner workings of a state department of transportation, while supporting WSDOT’s functions of providing sustainable, safe, reliable and cost-effective transportation options that improve communities and economic vitality for people and businesses. The project(s) executed by the AIR during the residency will be developed in close partnership with T4America, SSTI, and WSDOT. Possible projects may involve supplementing infrastructure design; fostering deeper community engagement with historically underserved communities; aiding WSDOT’s efforts to communicate construction, scheduling, and other updates; and/or improving processes in routine work. The WSDOT AIR follows a number of successful residencies in city agencies, but it is the nation’s first artist residency in a state agency. The WSDOT AIR is generously funded by ArtPlace America. WSDOT: The Washington State Department of Transportation is the steward of a multimodal transportation system and responsible for ensuring that people and goods move safely and efficiently. In addition to building, maintaining, and operating the state highway system, WSDOT is responsible for the state ferry system and a shortline freight rail system, and works in partnership with others to maintain and improve local roads, railroads and airports, as well as to support alternatives to driving, such as public transportation, bicycles and pedestrian programs. Transportation for America: T4America, a program of Smart Growth America, is an alliance of elected, business and civic leaders from communities across the country, united to ensure that states and the federal government step up to invest in smart, homegrown, locally-driven transportation solutions. These are the investments that hold the key to our future economic prosperity. As a community of practice, where participating agencies can learn together and share experiences as they implement innovative smart transportation policies. As a source of direct technical assistance to the agencies on transformative and replicable smart transportation reform efforts. As a resource to the wider transportation community, including local, state, and federal agencies, in their efforts to reorient practice to changing social and financial demands. ArtPlace America: ArtPlace is a ten-year collaboration among a number of foundations, federal agencies, and financial institutions that works to position arts and culture as a core sector of comprehensive community planning and development in order to help strengthen the social, physical, and economic fabric of communities. ArtPlace focuses its work on creative placemaking, which describes projects in which art plays an intentional and integrated role in place-based community planning and development. This brings artists, arts organizations, and artistic activity into the suite of placemaking strategies pioneered by Jane Jacobs and her colleagues, who believed that community development must be locally informed, human-centric, and holistic. The concept for the WSDOT AIR grew out of the recently published Arts, Culture and Transportation: A Creative Placemaking Field Scan [http://t4america.org/maps-tools/creative-placemaking-field-scan], produced by T4America with ArtPlace America. Released in 2017, the Field Scan explored how artists are contributing to transportation solutions, and identified state DOTs as a promising but as of yet untested venue for artistic intervention. T4America believes that embedding artists within state DOTs will help to drive new and creative approaches that help achieve state DOTs’ ambitious goals. Dwindling funding hinders the accomplishment of these goals, forcing DOTs to find creative approaches to improve safety, reduce congestion, enhance economic opportunity, improve reliability, preserve their system assets, accelerate project delivery, and ultimately create healthier neighborhoods for communities to grow and thrive. Simultaneously, T4America believes that embedded artists will benefit from learning how to better engage with the complex processes and projects overseen by state DOTs and therefore producing better and more meaningful work. WSDOT’s strategic goals include developing coordinated strategies for addressing preservation, safety, mobility, economic vitality, and environmental performance goals. WSDOT is a national leader in leading the development and delivery of transportation projects that are performance­-based, data­-driven, and guided by early community involvement. Recognized as a tool in pioneering innovative and creative solutions, AIRs have been piloted across the nation in governmental agencies, including Los Angeles and Seattle DOTs. AIRs have proven effective in rethinking design challenges, increasing community buy-in, fostering deeper community engagement, augmenting planning goals, building relationships with traditionally underserved constituents, and improving outdated processes in routine work. The AIR will be embedded in WSDOT for a period of 12 months and will begin with rotations through several of WSDOT’s divisions. These rotations will focus on providing the AIR knowledge on the operations of WSDOT, staff and administration priorities, strategic and daily challenges, and division culture. The rotations will serve to help the AIR determine WSDOT staff’s motivations and objectives so that the AIR may propose projects that directly address these motivations and objectives while also supporting T4A’s objectives of improving community engagement, supporting alternatives to single occupancy vehicle transport, and driving transportation solutions that improve safety and equity. Rotations shall conclude after four months; the remaining eight months will be devoted to the AIR’s project(s) development and production. Working in close collaboration with T4America and WSDOT staff, the AIR may decide to focus on one WSDOT division or process, or on several divisions or processes. The AIR will be a half-time contractor for Smart Growth America, and will report to SGA/T4America’s Director of Arts and Culture, as well as a steering committee consisting of staff from WSDOT, T4America, SSTI, and ArtPlace. The AIR will update T4America and SSTI staff monthly through video conferences. These updates, as well as quarterly updates from WSDOT leadership, will serve as the basis for a final report and a set of best practices to share with other state DOTs.After the completion of the residency, the WSDOT secretary and AIR will present a summary of the residency experience to the secretaries of the DOTs that participate in the SSTI community of practice to encourage adoption of this approach by additional state DOTs. The AIR and steering committee will share information on the residency through webinars and conference presentations in the months after its completion. Participate in monthly check-in calls with T4America and WSDOT staff. Participate in quarterly in-person debrief meetings with T4America, SSTI, and WSDOT staff. Maintain a working presence in WSDOT by attending and participating in WSDOT and community meetings, and meeting regularly with relevant WSDOT staff. Track work hours and project expenses, and invoice T4America for payment in accordance with T4America’s procedures. Once a project(s) has been decided upon, develop a work plan and provide clear and consistent communication with project managers and staff, adhering to WSDOT’s protocols. Become familiar with relevant agency processes to ensure that proposed projects directly connect to the actual work of WSDOT. Document the AIR process through visual, written, video, or other forms of documentation with the goal of providing instructions to future AIRs. Participate in project evaluation and the dissemination of lessons learned during the residency. Be prepared to present lessons learned and work produced through the residency at conferences and convenings as requested by T4America. Possession of a broad range of creative skills that are applicable to the development and execution of the residency, such as social practice, graphic design, fabrication, photography, writing, etc. Prior experience working in governmental agencies is not required but preferred. Basic knowledge of the diverse services provided by WSDOT and a sincere eagerness to learn more about the goals of WSDOT. This residency is open to artists 18 years of age or older who are eligible to work in the U.S. for the length of the residency. The residency will not sponsor green cards, visas, or citizenship. Paperwork should be sorted out prior to residency start date, which is not flexible. The AIR must be able to work in Olympia, WA for the duration of the residency. Artists working in any media are encouraged to apply, however, artists must have extensive experience with community engagement and collaboration as part of their practice. Artists at any career level may apply. The residency will include an ongoing public component including blogging and social media posts. T4America, WSDOT, SSTI, and ArtPlace retain the right to use documentation of AIR’s work, or the original work itself, in promotional materials. The AIR retains copyright to produced work. The AIR will be provided a stipend of $40,000 for the year-long residency. An additional $25,000 will be designated towards project implementation. Why are you interested in the WSDOT AIR opportunity? What do you hope to achieve during the residency? Describe your experience collaborating with professionals without artistic training, government agencies, and with diverse communities. How do you work to ensure that you are successful working across cultural differences? What does equity mean to you? How does your artistic practice relate to this definition? How have you used your artistic practice to identify and help address specific community development challenges? How will you approach the rotation phase of the residency? What do you hope to learn? What type of support do you think you will need ensure that your AIR experience is successful? Attach a PDF portfolio of relevant work samples. The portfolio should include a maximum of ten images. Links to video and/or audio files are permitted within the PDF. File size should not exceed 5MB. Each image should include a title including the artist’s name; title, date, and location of project; artist’s role in project and names of collaborators; budget; commissioning agency or client; project manager’s name if applicable. Attach a CV in PDF format. March 2019: Residency begins with orientation with T4America and SSTI staff, and continues with rotations through WSDOT’s divisions for four months. February 2020: Residency conclusion and final meeting with T4America, WSDOT leadership, and artist; second public webinar presentation.